The UAE will implement a series of measures, including entry permits, tax and customs exemptions and recognition of foreign driving licences, to ensure a seamless experience for the representatives of participant countries at Expo 2020 Dubai. In an agreement with the Bureau International des Expositions (BIE), the intergovernmental organisation responsible for overseeing and regulating World Expos, the UAE will also provide access to health insurance, education and the use of radio frequencies, to support Expo participants’ representatives and some family members. Expo 2020 will run for six months from October 20, 2020 and expects to welcome more than 200 participants, including more than 180 nations, multinational organisations, businesses and educational institutions. Thousands of people are expected to represent international participants on the site during the six-month event. They will be housed at the Expo Village, which will include 2,100 residential units, a retail mall and food and beverage outlets. 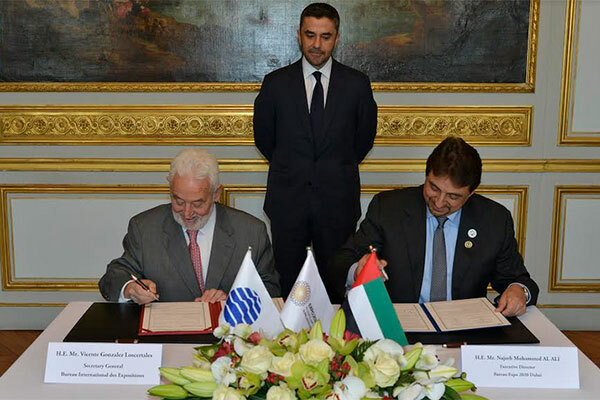 The agreement was signed by Najeeb Mohammed Al Ali, executive director, Dubai Expo 2020 Bureau, on behalf of the UAE Ministry of Foreign Affairs and International Cooperation, and Vicente G Loscertales, secretary general, BIE. The ceremony took place in the Embassy of the United Arab Emirates in Paris, and was attended by Omar Saif Ghobash, UAE ambassador to France. Loscertales said: “The BIE and World Expos are built on the principle that collaboration fosters innovation and drives progress. The UAE enjoys strong relationships with members of the international community and is facilitating the participation of countries, organisations and educational institutions, and their representatives, with the aim of delivering an Expo that brings the world together. The UAE will also establish a ‘one-stop shop’ to ensure efficient processing of relevant documentation. The special measures will be granted to Expo 2020 participants on a case-by-case basis up to 10 October, 2021. In line with its overall theme, ‘Connecting Minds, Creating the Future’, and underpinned by its three subthemes, Opportunity, Mobility and Sustainability, Expo 2020 is fostering creativity, innovation and collaboration on a global level. Expo 2020 expects to receive 25 million visits, with 70 per cent of visitors due to come from outside the UAE – the largest proportion in the 167-year history of World Expos.